See attached letter from the Court Manager at Bristol Civil and Family Justice Centre. We have extracted below the information relevant to those using the Family Court. Bristol Civil and Family Justice Centre’s car park was subject to a severe flood on Tuesday 27 June 2017. This has rendered the Bristol Civil and Family Justice Centre to be unavailable to house any court hearings or administrative support from HMCTS court staff until further notice. 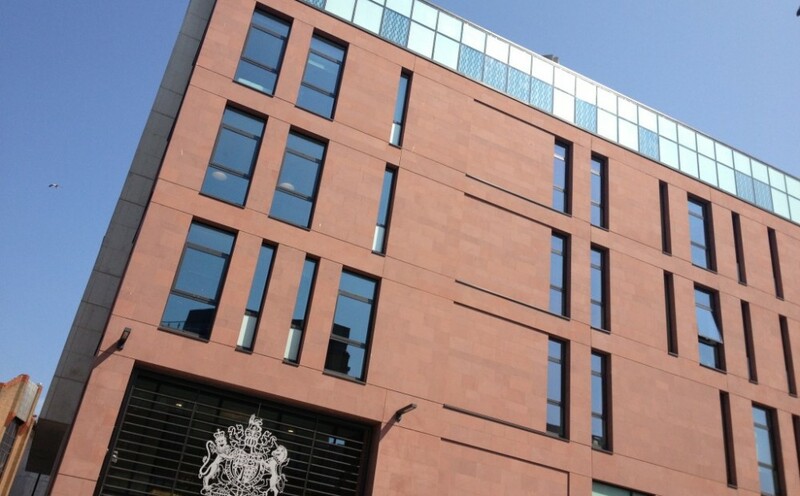 The main public counter servicing all civil and family enquiries is temporarily located on the 1st floor at Bristol Magistrates Court, Marlborough Street, Bristol from 9.30am to 2pm (Monday to Friday). Every effort is being made to keep all listed hearings in Bristol or in close proximity to Bristol. Other court venues such as Bath Magistrates Court, Taunton Combined Court Centre, Gloucester County Court and North Somerset Courthouse in Worle are also being used (if required). The court listing team will contact parties giving as much notice as possible in the event that travelling to other court venues is required or if your case has to be adjourned due to lack of court room accommodation. In the event of your case being adjourned this will be supported by a judicial decision as listing is deemed as a judicial function. Due to limited storage capacity at the temporary venues, all court users are asked to take any bundles with them at the conclusion of the hearing. Any bundles left in venues will be subject to confidential wasting procedures and will not be retained. There are limited consultation rooms available to use in our temporary hearing venues. If you occupy one of these consultation rooms for any reason, please ensure that you remove any possessions including court papers when you leave them. Please do not under any circumstances, leave any items in these rooms as this poses security risks. This remains unaffected by this incident and due to the current situation is the preferred method of communication but HMCTS appreciate that not all court users have access to e-mail services. Please note that due to the flood, the court staff have only had limited access to e-mails but that situation is now improving. As a result there may be a delay in responding to your enquiry. If you are sending e-mails to the court for hearings, please include the case number, date of hearing and the name of the Judge hearing this case (if this is known to you). The court e-mail addresses are available on the Bristol Civil and Family Justice Centre court finder page:-courttribunalfinder.service.gov.uk. Payments of court fees and warrant payments. Our normal service of accepting payments (by all methods) has been restored. Payments can be accepted via the temporary counter services at Bristol Magistrates Court between the hours of 9.30am to 2pm (Monday to Friday) or by telephone to: 0117 9302430 between the hours of 9am to 4pm (Monday to Friday). This service has been re-located to the 1st floor (room adjacent to Court 6) at Bristol Magistrates Court, Marlborough Street, Bristol. They also have a temporary contact number for customers to arrange appointments or enquiries which is 07756 976823. All post destined for the Bristol Civil and Family Justice Centre is being re-directed to Bristol Magistrates Court. As a result there may be a delay in responding to your enquiry or your issuing process. Please defer from contacting the court asking for updates on routine enquiries as this will enable them to deal with backlogs more quickly. Any court users involved in telephone hearings will be provided with the number for their conference provider to call by the listing team giving as much notice as possible. The main Bristol Family Court building on Redcliff Street in Bristol has suffered a serious flood and will not be opening for some time. Hearings are being held in other local court buildings in Bristol and the locality (largely Bristol Magistrates or Crown Courts). There is a temporary court office at the Magistrates court on Marlborough Street (by the bus station) and temporary phone numbers to use. These and other details are set out in a letter from the Court Manager, which you can read here. Please note, although this site is described in that letter as “The Family Court website” we are independent of the judiciary and Court Service, although we are very happy to disseminate this and other information to court users and will post updates as and when we have them. Any queries about these arrangements should be directed to the court using the contact details provided in the letter. 1. Gloucestershire CC – Many of you will have read that Ofsted has published a report about Gloucestershire County Council’s Children’s Services. If you haven’t, please can I suggest that you read the executive summary, at least. It can be found by following this link and then scrolling down to the link for the pdf version of the report (The file is called Single inspection of LA children’s services and review of the LSCB as pdf). 2. As you will know, I have published a number of judgments on the Bailii website to ensure that the public were aware of difficulties that are similar to those highlighted in the Ofsted report. I also met regularly with the previous management team to explain and discuss the issues arising from those judgments and other issues of practice. I very much hope that solutions can now be found to the difficulties that have been identified and I am grateful to the new management team for meeting with me on Wednesday to discuss how matters will be dealt with in the future. At the start of this year it was arranged that I should sit for one week in every month in Gloucester and, since early last year, District Judge Woodburn has been hearing public law cases there as well. I hope that the increased presence in Gloucester of judges specialising in public law cases will emphasise further the need for change and encourage it. I have asked that any public law cases that involve significant issues of practice should be listed in front of me; please can practitioners and courts in the area ensure that this occurs. 3. Orders – Getting orders drafted and issued imposes heavy demands on all those involved and the first thing that I would want to say is thank you to everyone for running the system so smoothly in this area. 4. It remains the rule that orders should be submitted to the court for issue within 48 hours of the hearing at which the order is made. This is demanding for solicitors and barristers but the demands would not be any different if we imposed any other timescale (e.g. it would not make any difference if we said 72 or 96 hours). On the whole, orders are sent in within 48 hours but please can I ask you to ensure that you do send them in within that time. 5. If the order includes provision for disclosure by the police or other third parties, please can I ask that a separate order is drafted for that disclosure. The order for disclosure needs to be issued as swiftly as possible following the hearing. If a short disclosure order is drafted and issued on the day of the hearing it means that the police, or other third party, are more likely to be able to provide the necessary disclosure within the time provided by the order. There have been a number of cases in which there has been a delay in drafting the long case management order and, as a result, the disclosure provisions within the long order have not been sent to the police until shortly before, or even after, the dates specified for disclosure. If a separate short order is drafted and sent out immediately that difficulty can be avoided. Where a disclosure order is made please can an email be sent immediately to the police, or other relevant third party, informing them that the disclosure order has been made so that they can begin to collate the material. 6. In a suitable case the judge or magistrates may wish to direct, at the end of a case management hearing, that the order may be submitted to the court office for issue without further scrutiny by the court of the drafting of the order. Plainly, there will be some draft orders which have to be scrutinised by the court before they are approved for issue. However there are some instances where straightforward orders are delayed in issue unnecessarily because they await approval following the drafting by the parties. Where the court does so direct, it will be essential that any email sending in the order should state clearly: ‘the court directed that this order should be issued immediately upon being emailed to the court, without being further referred for approval to the judge/magistrates’. Such a direction will be particularly inappropriate where there are penal provisions within the order. 7. Non-molestation orders need to be issued immediately following their making. It is very important that orders made in Bath or Weston-super-Mare, which are to be sent to Bristol for issue, are sent immediately to Bristol following the hearing. Where a tick box form is used by the judge / magistrates that document needs to be scanned and sent by email by the court staff immediately to the Bristol court office for issue. There has to be liaison between the courts involved to ensure that there is no delay in the issue of orders of this kind. Particular difficulties can arise where orders are made on Friday because it is essential that the orders are issued, sent to the police and sent for service before the weekend. If there are difficulties in relation to this, there must be communication with court immediately. 8. If there are urgent private law orders to be issued, emails containing any draft orders must be marked urgent when they are sent in to Bristol. Orders are issued and drawn up in Bristol, even when made in Weston-super-Mare or Bath (this does not apply to Gloucester, of course). Once issued, the order can only be sent to the applicant/the applicant’s solicitor on paper by post or DX, the order cannot be emailed to the applicant/applicant’s solicitor for issue. In circumstances where the applicant needs a copy of the sealed order immediately (e.g. where there is a prohibited steps order following the retention of a child or threatened removal) the sealed order can be scanned by Bristol and sent to Weston-super-Mare or Bath where it can be printed there. However, the applicant/applicant’s solicitor must arrange to collect the order and must liaise with the court to ensure that an agreed system is in place for that to occur. Otherwise, the only other way in which the applicant/applicant’s solicitor will receive a copy of the order is through the post/DX. 9. It is particularly helpful to the court staff if typed orders can be submitted (i.e. not in manuscript) and can also be produced on the right forms (e.g. on CAP forms). 10. Out of hours hearings – Please can I ask that everyone is familiar with the system for hearings that need to take place outside normal court hours. It is too late to try to find out once emergency has arisen. If you don’t know the system please ask the court office to provide you with information about it. 11. Urgent hearings in normal court hours – if a local authority or other court user knows that an urgent application will be made please inform the court as soon as this is known. In particular, if a Local Authority knows on a Thursday that an EPO application is likely to be made on Friday, please can the authority let the court know on Thursday and not leave it until Friday before setting in hand arrangements and applications for a hearing. It is unfair on court staff and judges where applications are brought to the court in a rush on Friday afternoon without warning (e.g. because police protection powers under section 46 of The Children Act 1989 are due to expire over the weekend). If you do apply late and without forewarning you may well find that your case has to be dealt with under the out of hours procedures. 12. Judges seeing children – we do seem to make little use of the procedure that is available for judges to see children (see page 1530 of the 2017 Red Book for a summary of the guidance about this). When dealing with cases involving children please can I ask you to think carefully about whether it would be beneficial for the child to meet the judge. After all, which of us would like a major decision to be made about our lives by someone upon whom we had never clapped eyes? 13. 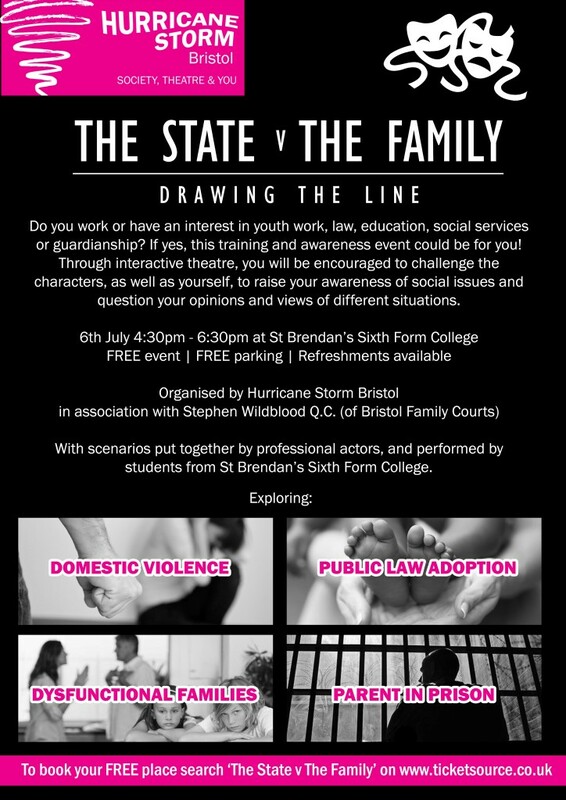 Theatre – I have been working with St Brendans College in Bristol and we have set up a theatre production group to stage scenes showing some of the social issues with which the family court deals. The first production will be on 6 July 2017 at St Brendans College (doors open at 4 PM and the production will last from about 4:30 PM to 6:30 PM). This will be interactive, or forum, theatre in which the actors will play out scenes on stage and then, with the aid of a facilitator, the actors will discuss with the audience what is happening, ask questions of the audience and take questions from them. The first production will cover domestic violence, the removal of a child from a mother in public law proceedings, a comedy sketch about dysfunctional families and a scene involving a father in prison grappling with indirect contact. If you would like to book into this event please do so by accessing the website: www.ticketsource.co.uk and entering ‘The State v The Family : Drawing the line’ in the box marked ‘Search events’. Tickets are free and I do hope that you will be able to support this event. 14. As ever, thank you to everyone for working so hard to keep our very hard pressed system running as efficiently as it does. Download word version of this document. Where : St Brendan’s Sixth Form College. Do you work or have an interest in youth work, law, education, social services or guardianship? If yes, this training and awareness event could be for you! We will be exploring Domestic Violence, Public Law Adoption, Dysfunctional Families and Parent in Prison. Through interactive theatre, you will be encouraged to challenge the characters, as well as yourself, to raise your awareness of social issues and question your opinions and views of different situations. If you would like to book into this event you can book on the ticketsource website here. His Honour Judge Wildblood QC is the Designated Family judge for this area. Download his latest newsletter Newsletter. At 4.30 p.m. on 25th May 2017 in court 7 at The Bristol Civil and Family Justice Centre we will hold a debate on the above subject. Speakers on each side of the motion will have no more than a total of 15 minutes to put across their arguments before you, the audience, will be asked to contribute to the debate. The event will be chaired by Judge Stephen Wildblood QC. The event will end by 6.10 pm. The public and the media are welcome to this event and we hope for as diverse an audience as possible. We are keen to promote the work of the multi faith support unit that operates from our court. John worked with a London law firm from 1977 to 2016. He was Chairman of the Lawyers’ Christian Fellowship from 2003 to 2011. He is the author of A Contractual Guide to Major Construction Projects (1999), EPC Contracts and Major Projects (2012), Belief and the Nation (2013) and he contributed toReligion and Law, Theos (2012) and Magna Carta Unravelled (2015). Paul is an outstanding preacher who has chosen to speak against the motion. He says: ‘I think there are some very interesting lines of enquiry to pursue about what the Western world’s legal system would forfeit if underlying religious (specifically Christian as far as most Western nations are concerned) principles were jettisoned’. Although only 15 Tom spoke at the last debate that we held and did so with such outstanding fluency and maturity that we have asked him to return to speak at this conference. We will send out a list of ground rules governing the debate. Please only book into this event if you are sure that you will attend or if you will find someone else to take your place if you do not. It is unfair on others if you simply reserve a place without commitment to attending. We will ask you to make a contribution of £5 to the charity, the Personal Support Unit, if you do attend although this is without obligation. Bristol – A pioneering Family court. But what more should we be doing? On the 4th May 2017 at 4.30 p.m. HHJ Wildblood QC and District Judge Cope will be leading a conference to explain what is being done here to help people have a better understanding of the work that we do in the Family Court. However, more importantly, we will be inviting your views on what else we should be doing. In particular we want to hear your views about what more we should do to support litigants and help litigants in person. Your views matter and we want to hear them. The public and the media are welcome to attend the conference which will run from 4.30 p.m. to 6.00 p.m. and will take place at The Bristol Civil and Family Justice Centre, 2 Redcliff Street, Bristol, BS1 6GR. If you would like to attend please book in by e-mailing Jerry Fowler. The address is jerry.fowler@hmcts.gsi.gov.uk. Are too many children coming into the care system? Can better community care prevent this? Recent research has indicated that the number of children coming into care is rising and that this is even more prevalent in deprived areas. In view of drastic cutbacks in statutory funding to both children’s centres and voluntary organisations this figure is only likely to rise. Homestart is one such organisation that supports vulnerable families and is holding this conference in part to fundraise. Speakers include Anthony Douglas CEO of Cafcass, Dr Freda Gardner psychologist and court expert, Annie a mother who had her children removed from her and then returned after the court process, Professor Kate Morris head of social work at Sheffield University and researcher into this topic. Tickets can be purchased via Eventbrite here. Ticket enquiries (early booking discount, group/special discounts etc) should be sent to first1kdays@gmail.com. A reminder that other regions who are interested in creating a version of this site for their region, we are working with The Transparency Project through our licensing project to make this possible for a fixed fee. You can read about that scheme on the Transparency Project website here. London Borough of Hackney v Williams  EWCA Civ 26. At 4.30 p.m. on 23rd March 2017 there will be a conference in Court 7 of the Bristol Civil and Family Justice Centre, 2 Redcliff Street, Bristol, BS1 6GR to consider the decision of the Court of Appeal in this case. In particular we will consider the implications of the case for practice relating to accommodation under section 20 of The Children Act 1989 and also to claims for damages under the Human Rights Act 1998. The speakers will be announced in due course. Those who wish to attend should inform Rebecca Cobbin (rebecca.cobbin@hmcts.gsi.gov.uk). If you book place please ensure you do attend or else that you find someone to take your place. Find HHJ Stephen Wildblood QC's newsletters here. We've put together a list of useful YouTube videos that might help you with understanding things like mediation, how to make an application to court, and what might happen at court. You can view those videos here.